"As the Kindle Fire maintains popularity in the tablet ecosystem, it was extremely important that we accommodate that market," said Norman Fong, CEO and Co-Founder of BuyVia. 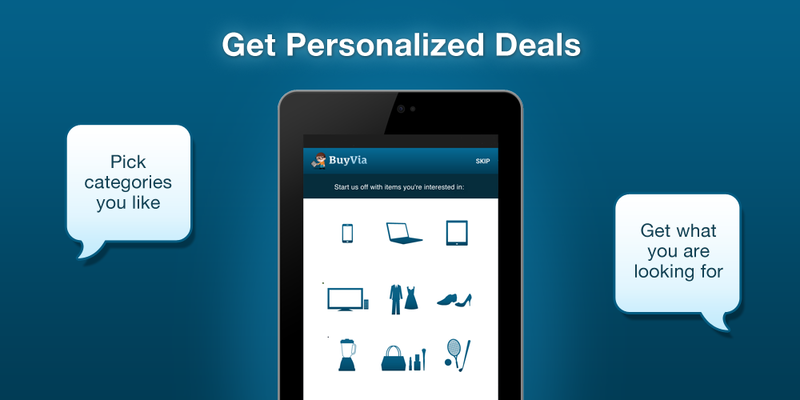 BuyVia, an app/website that stores shopping searches and preferences in the Cloud and delivers the best online/local buys to all your devices, today announced the release of its Kindle Fire app which links shopping searches, preferences and the best curated deals across a user’s laptop, tablet and smartphone via the Cloud. Kindle Fire owners can now easily find quality products at the best price both online and in-store while also syncing their search history and shopping preferences automatically across all of their devices. Additionally, consumers can now enjoy BuyVia’s expanded product inventory which, since its launch in November 2012, has grown from 500 vendors selling 100,000 products to 16,000 vendors selling over one hundred million products. With the BuyVia app, users can set product preferences, develop a shopping list, save barcode scans from their visits to stores, set a desired price on any given product, and it’s always available in their BuyVia app. The app intelligently learns and uses knowledge of the user’s preferences to deliver the most relevant/personalized deals available—without vendor or brand bias (many deal sites/stores have private partnerships that incentivize and limit the deals presented to customers). The shopping service can also alert users when selected products fall in price. It will even automatically alert users to a desired product on sale in a local brick-and-mortar store when they are walking or driving by the store offering that price within 20 miles. The BuyVia app delivers geo-local instant deals based on local availability by category, store and immediate location. This feature can also be customized so that users can click on deals or set the app to send an alert via push notification on deals for the products that were selected based on preferences, searches, prices, or items the user has scanned via UPC barcode. Furthermore, BuyVia is the only unbiased shopping service providing expert reviews. Additional BuyVia Kindle Fire information can be found on BuyVia’s Two Cents Blog. Based in San Mateo, California, BuyVia is the only online and mobile smart shopping service that combines intelligent shopping capabilities including a set your price feature, UPC/QR scanning, geo-local deals and wish lists. BuyVia is a combination of hand-curated expertise combined with a custom architecture and uses this technology to uncover reputable products at the best price available. Products and deals will be available through charter partners Amazon.com, HP, NewEgg, PriceGrabber, Dell, TigerDirect, Sony etc., but because of BuyVia’s unbiased approach, any product and deal available anywhere on the Internet will be delivered to shopping app/website users. The iOS, iPad, Android and Kindle Fire app downloads are available via the Apple App Store, the Google Play Store and Amazon’s App Store. For more information visit http://www.buyvia.com, like us on Facebook http://www.facebook.com/buyvia or follow us on Twitter @BuyVia.